The colonial homes of Granada have secrets. Lush courtyards, cool plunge pools, fountains, and art. In their shade, old men in rocking chairs nod you a “buen dia.” (It’s how they say it here.) Their wives might look up from embroidery and smile. 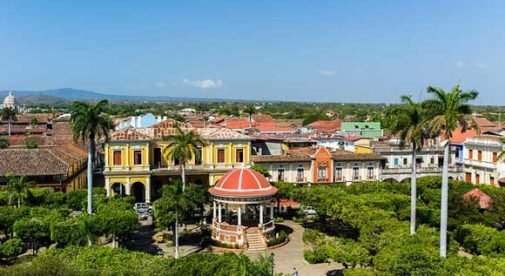 Tourists come in their droves to savor Nicaragua’s “Grand Sultan,” as this city is called, but relaxed and cultured, Granada has kept its tropical bygone charms. Skepticism and opportunity brought me to Nicaragua. Skepticism helps with my job, particularly when looking at real estate. I had to see things for myself, get a sense of the market, talk with folks, and see some properties and lots. The opportunity that brought me is the stuff of big ideas. It’s hard to over-emphasize the pace of change in Nicaragua that makes it a “get in now” place. Everywhere I go, the talk is of game-changing infrastructural projects. A new coast road…a new private hospital here…a new pier there… I made a point of going to see the earth-moving machines in some places. Rumor becoming fact. Granada is a place to stroll on the shady side of the street, dipping in and out of fine cafés, bookstores, and good restaurants. The museums are interesting, and the people are lovely. The cost of living here is very low, too—you’ll do well on $1,000 a month for a single person if you own a home, or $1,200 as a couple. No matter how much research you do before you go to a place, you’ll always find a surprise. For me, it was the quality of the ceramics here: The sidewalks are chequered with tiles, green, red, terracotta, and patterned… Poking my head through the doorway of one old colonial, I found a small factory where each tile was being handmade. It’s cheaper to use these handmade tiles than use mass-produced ones. The high-quality of craftsmanship in the furniture here isn’t reflected in the price. Heavy tropical woods and delicate wicker are everywhere. Furnishing a place in style is not only easy and cheap, but it’s fun as it will take you to the craft villages, each specializing in something different. A block from the Convento San Francisco, I looked at a colonial-style, two-bedroom home. It was pretty special, with a plunge pool in the living area, high cane ceilings, and a shower room full of tropical plants, almost like washing in a jungle waterfall. Blue-and-white tiling and hardwood interiors make for good finishes. The price is $120,000 and you could rent it for $1,000 to $1,400 a month, which would be no problem given the location—at the higher end of the scale, $1,400 per month would give you a gross yield of 14%. It’s on a dead end, a quiet part of town with no traffic, but in just a few minutes you can walk to the central park for a plate of Granada’s signature dish of vigaron (chicaron, fermented cabbage and yucca). You might not make it though, as that walk takes you right past a new expat-run restaurant called Bocadillos, where I was surprised by the variety and quality of Nicaraguan-brewed craft beers. A few steps more and you’re at Kathie’s Waffle House or the Garden Café, both popular expat hangouts. The smartest expats I met have bought lots out of town near Laguna Apoyo and built homes where an uninterrupted lake breeze and the higher altitude makes for a much cooler climate. I visited with them, enjoyed their volcano views and felt very jealous indeed. A lot here costs around $30,000 and you could build for as little as $300 per square foot. I have a ways to go before finishing my tour of Nicaragua. But, already, I have seen enough to say buying a property in Nicaragua might be the single smartest thing you can do this year. I have even seen some unusual opportunities, like land on a volcanic island where a “get-away-from-it-all farm” would cost you $1,000 to $2,000 for a manzana (1.73 acres). In the beach town of San Juan del Sur, I looked at one stunning ocean-view home going for $579,000. It would rent per night for $400. In the same small development, two years ago, an identical property sold for $400,000. With the new coast road running right past this place, linking the town to Costa Rica and to the northern beaches and the airport at Tola, there’s every sign prices will continue to rise.